While clearing out the garden for spring vegetables, we discovered a row of French Breakfast radishes we had forgotten about. The plants have been completely ignored since we started the seeds last September, but they have thrived nevertheless. 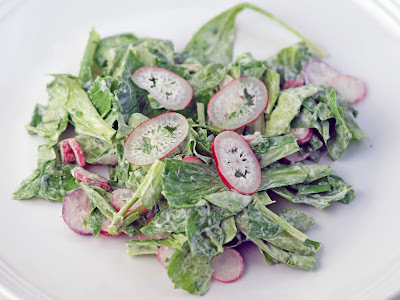 If you think of radishes as nothing more than a salad garnish, this recipe will open your eyes to the potential of radishes as the star ingredient. 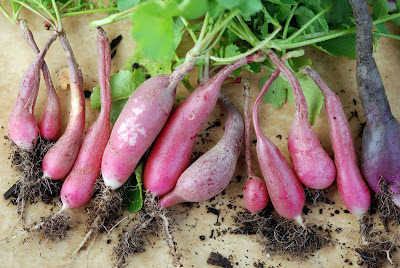 With a great peppery flavor, crunchy texture and beautiful color, our radishes are incredible. Here we combine the radishes with mache from the garden, another vegetable that has loved our long, cold (well, Houston's version of cold) winter. 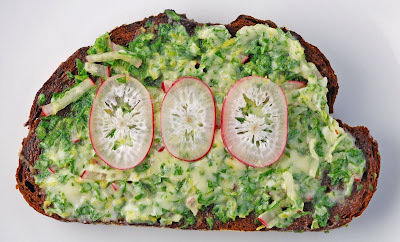 One bunch of radishes and their greens combined with the mache makes a wonderful salad and sandwich. Eaten together, an amazing meal celebrating the radish. Make dressing: Combine lemon juice and salt well. Add half and half and onions and blend well. Season to taste. Tear mache into bite-sized pieces. Slice radishes into thin rounds. Set aside one quarter of the radishes, then cut remaining radishes rounds into thin strips. Finely chop the radish leaves. Place radishes and leaves on paper towels to absorb excess moisture. Combine butter and lemon zest. Add radish strips and chopped radish leaves and mash everything together. Season with salt and pepper to taste. Spread mixture on toasted rye bread slices. Add radish rounds on top, sprinkle with a bit of sea salt. 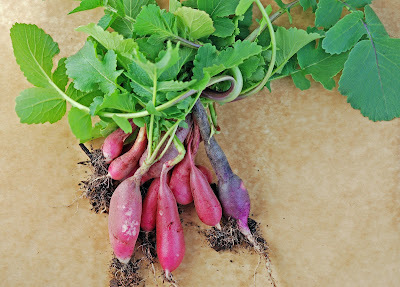 For the salad, combine remaining radish rounds with mache leaves. Add dressing to lightly coat the greens. Season with sea salt and serve. You know, I was just thinking about radish and butter sandwiches - it's so cool that you had a surprise row just hiding out (they probably thought they'd had you fooled, silly radishes). Jason shares your appreciation of the radish as more than mere salad decoration. He loves exotic varieties and introduced me to eating them plain with black Hawaiian salt. Sooo good. Mache is perfect with them, too, I bet. Btw, for the couscous, I was thinking maybe falafel would be a good veggie version, maybe? you know..this is one salad..where everything is new to me..and all of it together looks something so exotic that I wish i could pull it off! But I rarely use radish...well actually never...so for mache...but this looks good enough that I will go out, get the stuff and definitely make it...lovely find for myself! this looks absolutely delish! I love the stuff you do with vegetables. Wondering why they call those French radishes, love them, they're absolutely delicious with salt and butter. Great sandwich, hmmmm simple but so tasty! I will be making this deliciousness for sure! Great way to get the radish greens in. Looks delicious! This is just pure goodness. You've just opened up my mind about vegetarian sandwiches. You're wowing me here. Just beautiful. Loving your blog, your taste.... yep!